Christmas was wonderful, but I’m pretty pooped from all the baking and cooking! 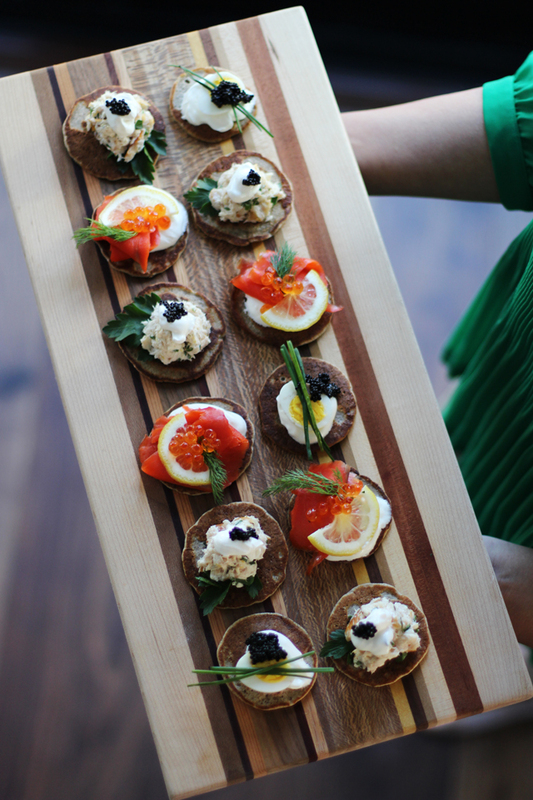 So in planning for a New Year shindig, I want to keep the cooking easy but serve some elegant appetizers. These buckwheat blinis are great party food– they’re light and airy from the yeast and whipped egg whites. The buckwheat batter can be prepared hours ahead and they simply need to be cooked off right before your party. They’ll keep warm in an oven until you’re ready to serve them. I’ve made three combinations using smoked fish, quail eggs and caviar, but you can use whatever inspires you. I didn’t include a recipe but did include the ingredients I used. I suggest playing around with whatever ingredients you like. 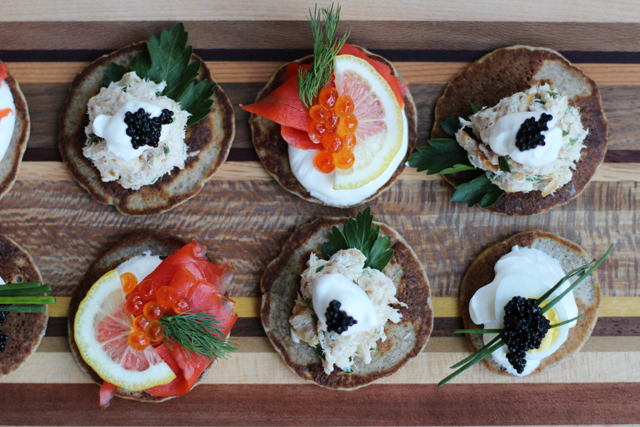 These buckwheat blinis are the perfect canvas for bite-sized flavor! Make the batter at least 3 hours before serving. 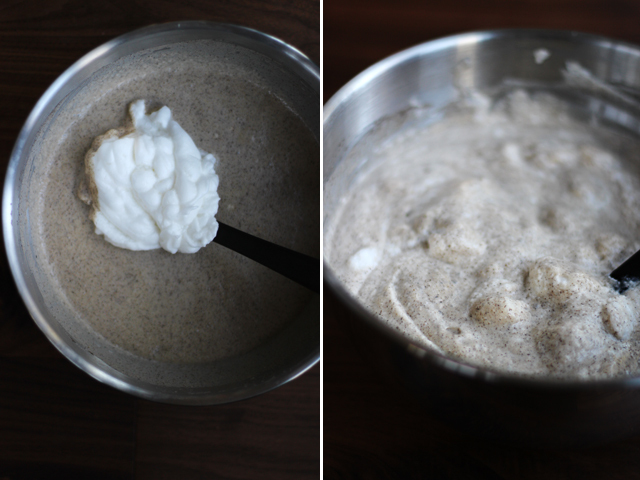 Whisk the yeast with the warm milk in a large bowl until dissolved. Whisk in all purpose and buckwheat flours and salt until smooth. Add melted butter and mix. Cover with plastic wrap and let it rise for about 2-3 hours. When you are ready to cook, beat egg yolks and mix into batter (the batter should look bubbly). Whisk egg whites until stiff and carefully fold into the batter a third at a time until evenly incorporated. Pour batter into a squeeze bottle. I cut the tip so the opening is about 1/3 inch wide. Heat a non-stick pan on medium-high heat and melt a little butter in the pan. 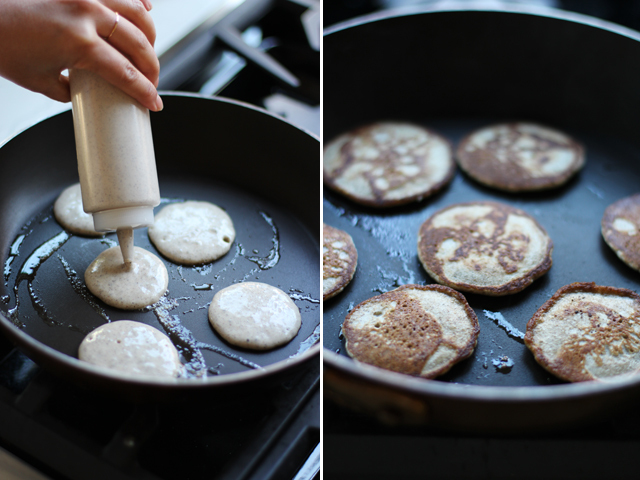 Squeeze enough batter to create 1 1/2 inch wide blinis. Cook for about 1 1/2-2 minutes on each side until cooked through. Transfer onto a cookie sheet lined with parchment until you are ready to serve and keep in a low heated oven to keep warm. Meanwhile prep your topping ingredients. 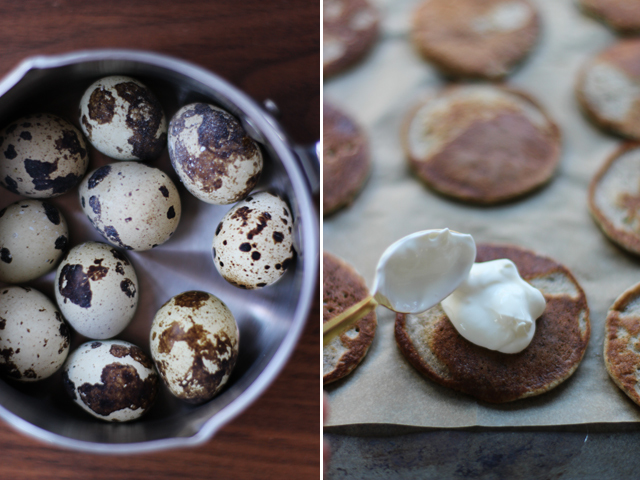 For quail egg blinis, boil the quail eggs for four minutes. Cool and peel. 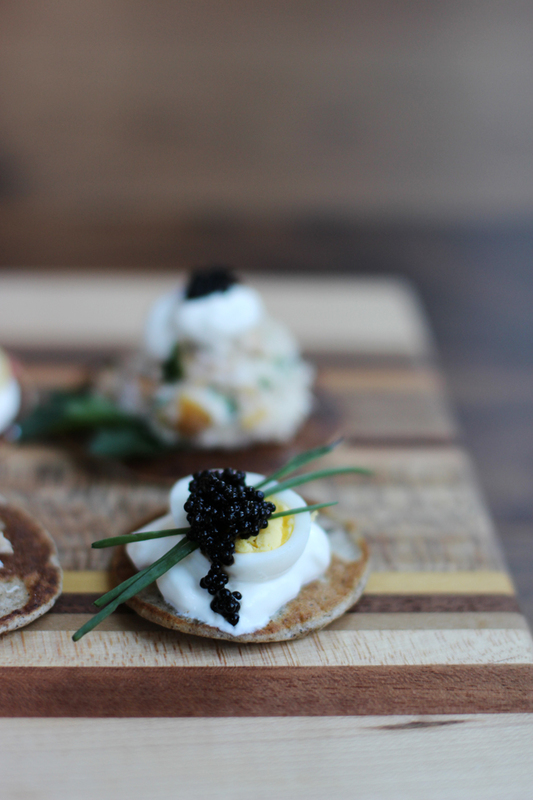 Dollop a buckwheat blini with creme fraiche and top with a hard boiled quail egg and sturgeon caviar. Top with chives. For the smoked trout blini, place smoked trout in a bowl removing skin and bones. Add minced chives, lemon zest and little lemon juice. Add enough creme fraiche until moist and consistency of a pate. Top with flat leaf parsley and more caviar and creme fraiche. 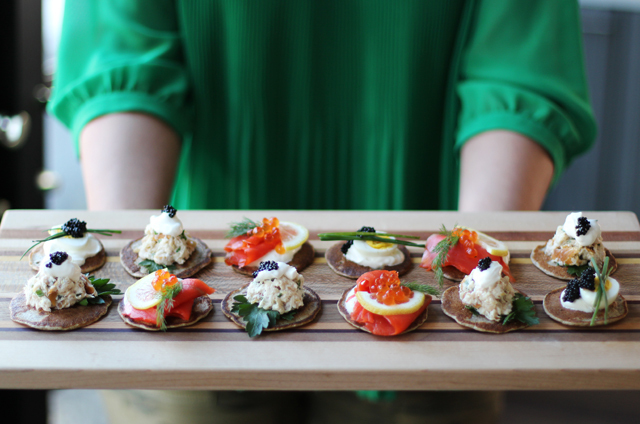 For the smoked salmon blinis, dollop creme fraiche on a blini and top with sliced lox and top with paper-thin sliced lemon, salmon roe and sprigs of dill. 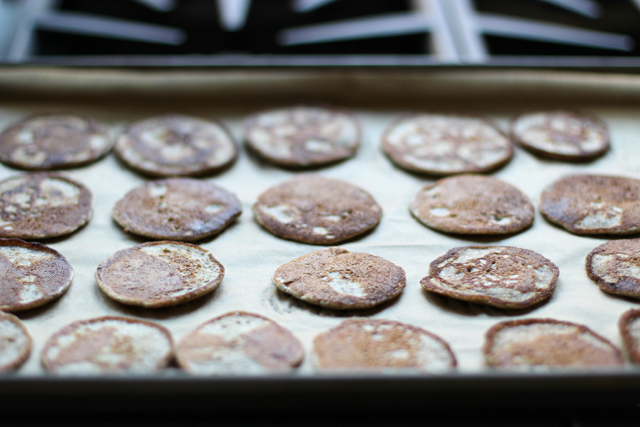 So as you can tell from my name, I’m Indian and we make buckwheat rotis all the time at home. Healthier and it’s a nice change. This would be incredible to make as a unique rendition of a classic recipe!